Ordering information is below. Several key new books have been printed. Happy Reading! 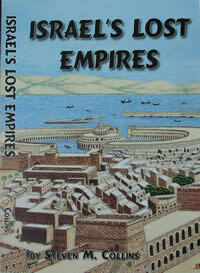 More information is presented documenting the worldwide scope of the Israelite/Phoenician Empire. Hebrew/Phoenician artifacts and inscriptions have been documented widely in North America, but these facts have been suppressed by a modern world that is devoted to evolutionary fables instead of historical truths that support the Bible. This book will offer readers the truth about the extensive navigational and maritime skills of the ancient Israelites and Phoenicians, and it reveals their worldwide reach. The Israelite/Phoenicians established a network of colonies throughout the Mediterranean Sea, in Western Europe, the British Isles and North America. Considerable new evidence is offered to document the extent to which they explored North America in a search for metals and raw materials to meet the need for Solomon's Temple for God and his other gargantuan, building projects. Israel and Judah became two separate and often-hostile kingdoms after the United Kingdom of Israel fell apart during a very bloody civil war. The northern ten tribes of Israel increasingly adopted the religions and customs of its allies: Tyre, Sidon and Egypt. Judah, the smaller kingdom retained the capital city of Jerusalem, but they were afterwards excluded from the Israelite/Phoenician maritime alliance. The Kingdom of Israel gradually degenerated as a nation as they disobeyed God, but they remained a dominant naval power. The drought in Elijah's time stimulated waves of Israelite migrations from their homeland and they founded new colonies for their people, including Kirjath-Hadeshath (identified in modern texts by its Roman name: "Carthage"). There is a myth that the Israelite tribes all went into captivity when Samaria fell. In fact, the Bible and Assyrian cuneiform records agree that few Israelites were left in the land when Samaria fell. While many had gone into captivity in earlier Assyrian invasions, most Israelites migrated voluntarily by sea and land to several new locations to begin rebuilding their national strength. There is much evidence documenting the voluntary migrations of the Israelites out of their old homeland to avoid Assyrian invaders. The kingdom of Judah continued longer in the land, but its people also eventually were removed during invasions by the Assyrians and Babylonians. After Israel's ten tribes relocated elsewhere, their "free" descendants build two new empires. The ancient Greeks and Romans wrote a great deal about both of the new Israelite empires, but modern texts have almost completely deleted their histories from modern textbooks. This deletion has hidden and obscured the major role of the ten tribes of Israel in all periods of world history. The first major new Israelite Empire was called "Carthage" by the Romans. Unlike the land-bound Greeks and Romans, Carthage built a maritime, commercial empire linking its colonies on several continents. Carthage's language and culture was based on its Hebrew origins. Many Carthaginian (i.e. "Punic") inscriptions confirm their presence in the ancient Americas and their connections with Meso-American cultures is also documented. The interaction of Old World civilizations with ancient New World cultures (and specific American Indian tribes) is periodically examined. Carthage long warred against Greece and Rome, dominating Rome for centuries. The true history of the Punic Wars are detailed in this book, including an observation that it was likely God's intervention which prevented the Carthaginian General, Hannibal, from completely conquering Rome. If Carthage had annihilated Rome, as almost happened during the Second Punic War, Rome could not have risen to fulfill biblical prophecies about it. Carthage was a huge city, the richest in the ancient world at that time. Where did its population flee before the Romans finally conquered Carthage? Simultaneous with the rise of Carthage to power in the Mediterranean world, another new power rose to prominence in Asia. This new power was Scythia, and its tribes were named the Sacae. The term "Sacae" preserves the name of the Hebrew Patriarch, Isaac, fulfilling God's promise in Genesis 21:12 that Isaac's name would be placed on Abraham's "birthright" descendants. Scythia's Israelite origin is extensively documented. The names of many Israelite tribes and clans are present and identifiable among the Sacae tribes. The Scythians also renamed all of the rivers emptying into the Black Sea, giving each one a name based on the name of the Israelite tribe of Dan. The Scythians were located to the north of the Medo-Persian Empire and twice crushed huge Persian armies that invaded Scythia. The Scythians are mentioned in both the Old and New Testaments, but they are called by their Greek name ("Scythia") only in the New Testament. The Greeks wrote extensively about the Scythians, but modern texts have almost entirely censored this ancient power out of the textbooks. Read an interesting excerpt from this book on the "Book Excerpts" section of this website!